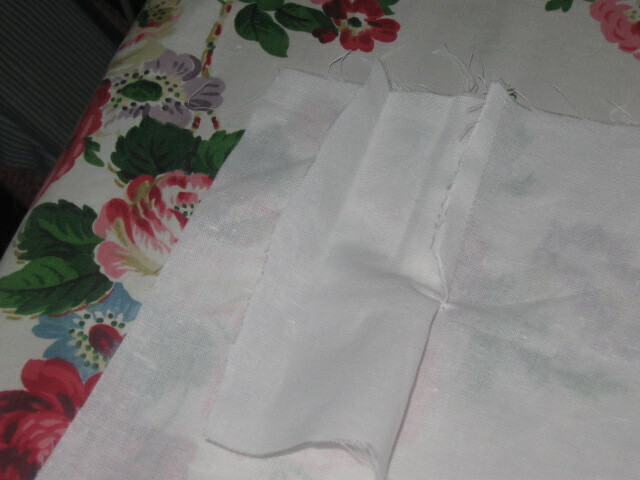 Sewing a shirt sleeve placket..tutorial.. 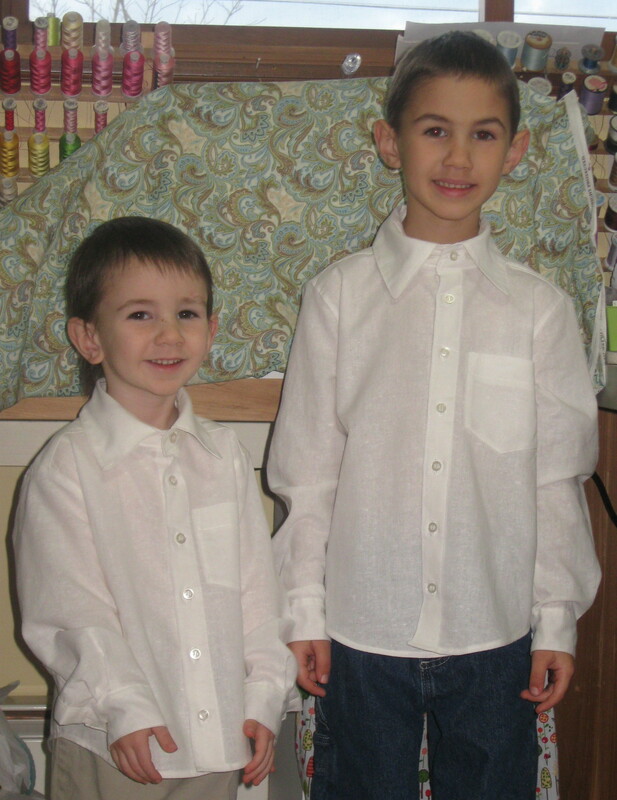 Finally we did this placket and finished the linen shirts! Life is full! I want to start by saying I purchased Fiona Bell’s book “Sewn With Love”. This book has classic patterns for children’s clothing. The patterns are on a cd and you print them off for your use. The sewing instructions are in the book with some pictures but scanty. 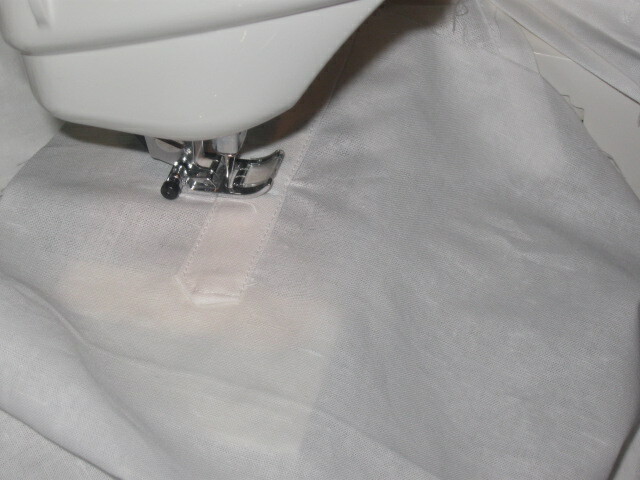 I have been sewing for 34 years and had never done a man’s shirt, or boy’s shirt with the button cuff and placket. This appealed to me and some of the other styles in the book also, piqued my curiosity so I purchased it. I have 8 boys and my husband and thought a shirt would be a good thing to know how to make. I practiced on a little flannel shirt for my 3-year-old. Then Victoria and I made my 15-year-old a John Deere print cotton shirt, and my 8-year-old a different John Deere print cotton shirt. 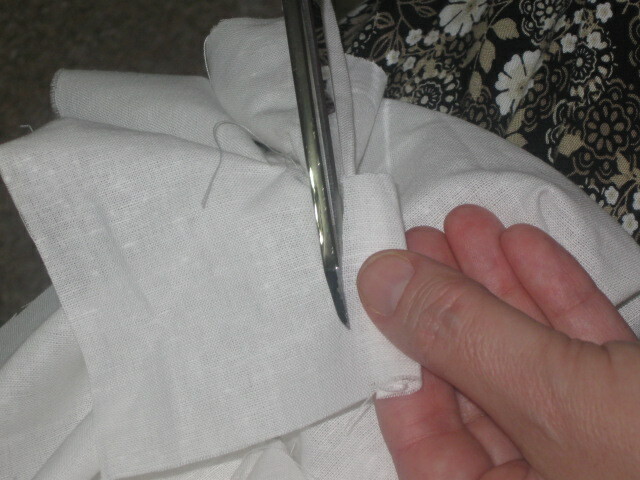 My dream was to be able to make cool 100% linen “church” or dress shirts. 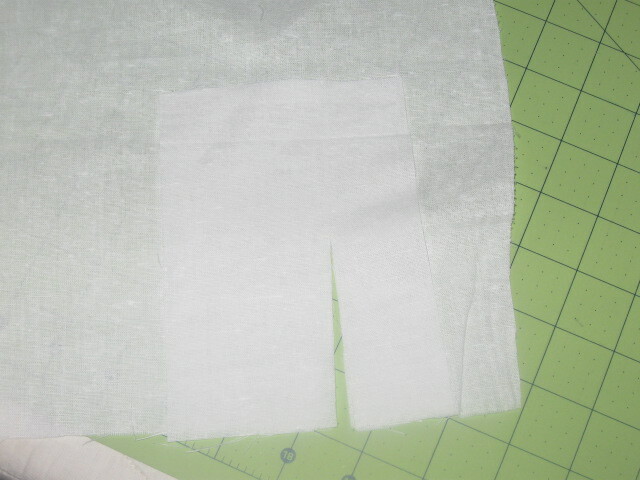 Again, I started with my baby boys, smaller, less fabric to mess up and waste, right? After 5 shirts, the plackets are getting easier, but the instructions in the book are not descriptive and helpful enough for an advanced beginner to understand. Victoria, my 19-year-old, fresh brained daughter and I decided to do this tutorial together. 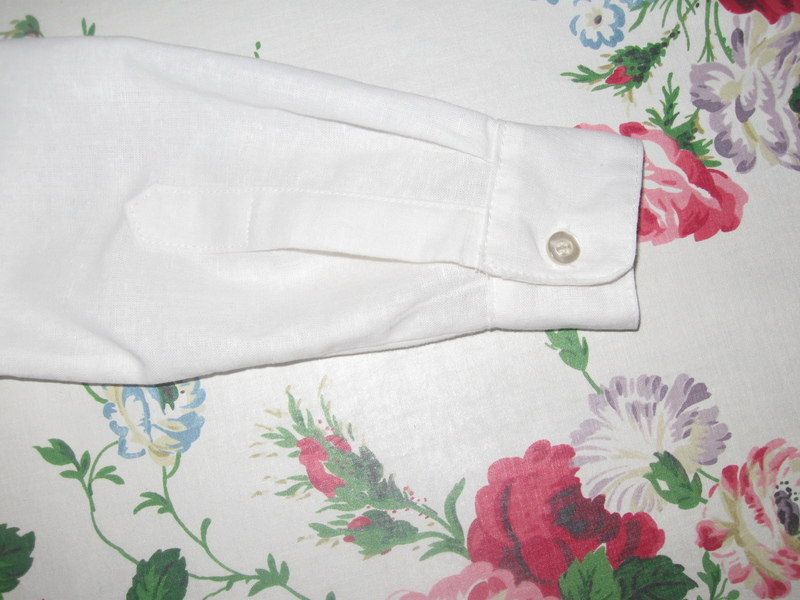 If you ever want to tackle a button sleeve placket we hope this helps you!!! 1. 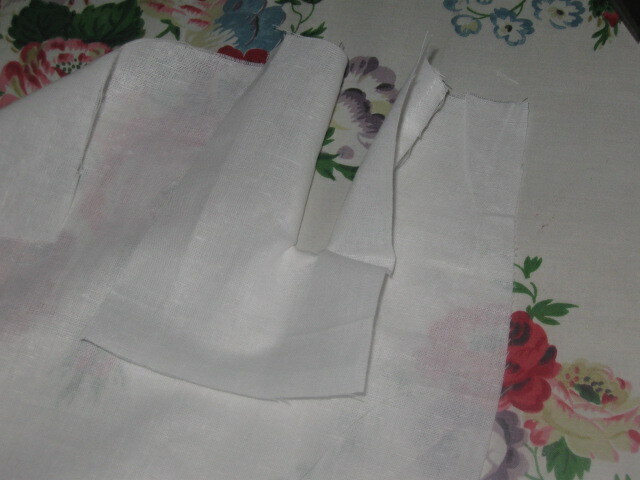 Line up sleeve and placket piece …wrong side of sleeve fabric to right side of placket piece..
Notice the placket rectangle piece is cut at approximately the 1/3 point. 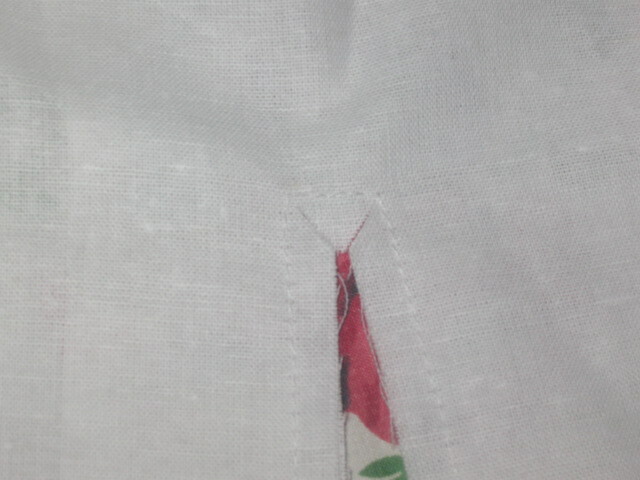 So sorry this linen is hard to tell right side from wrong side. 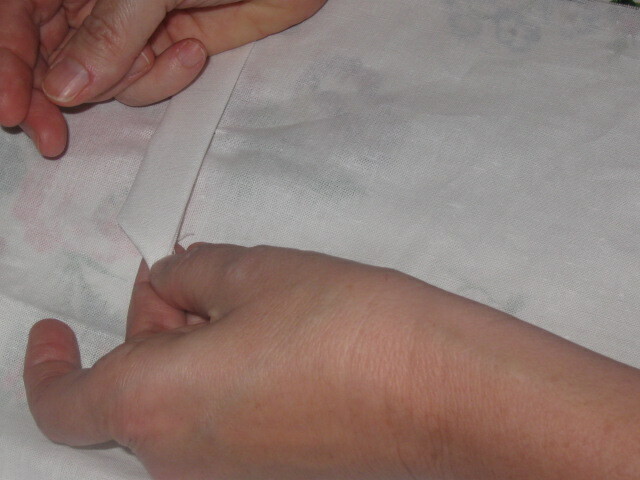 This pattern didn’t advise cutting your placket first, but this way worked best for us. 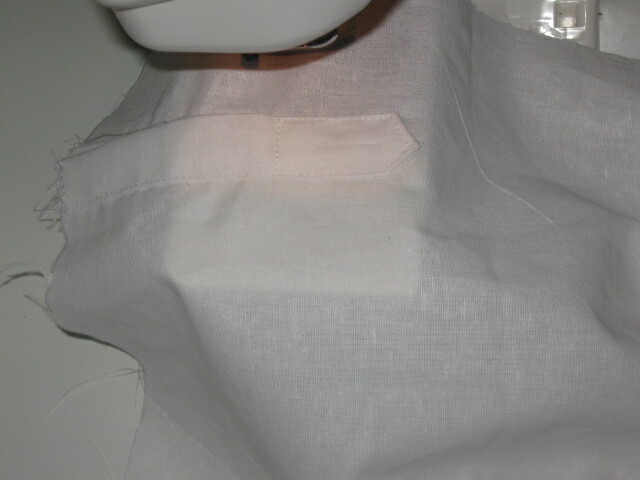 Now sew placket and sleeve together around cut making a u seam with 1/4″ seam allowance. 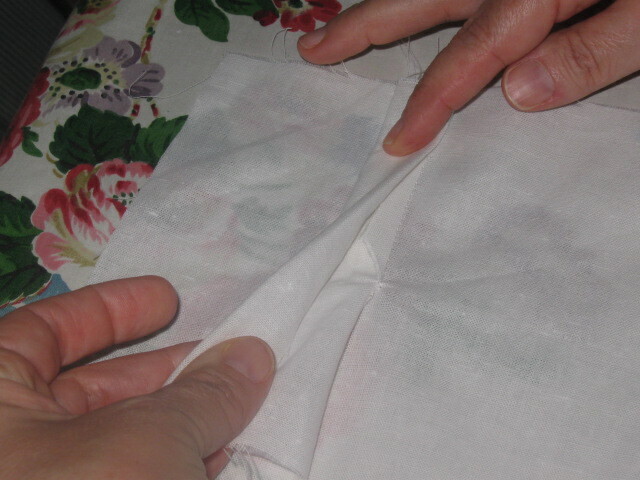 Now you are ready to do the thin side of your placket..
First you invert your placket to the right side of your sleeve.. This little dot is where we are going to sew up to. You can pin if you like. 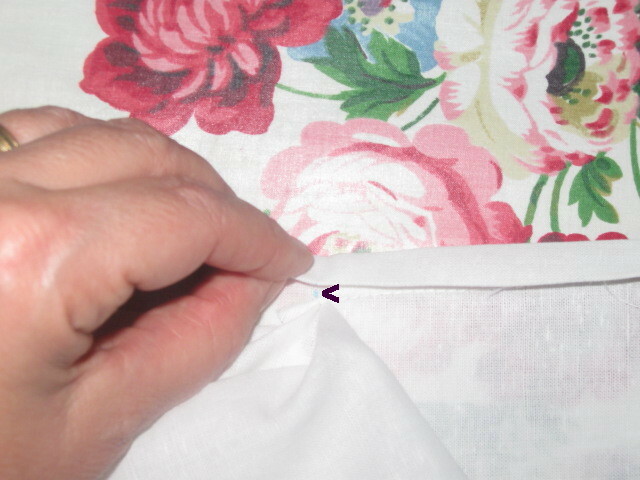 Now you take the sleeve to your machine and sew a nice top stitch very close to the edge of your fold up to the pin or marking we just made. 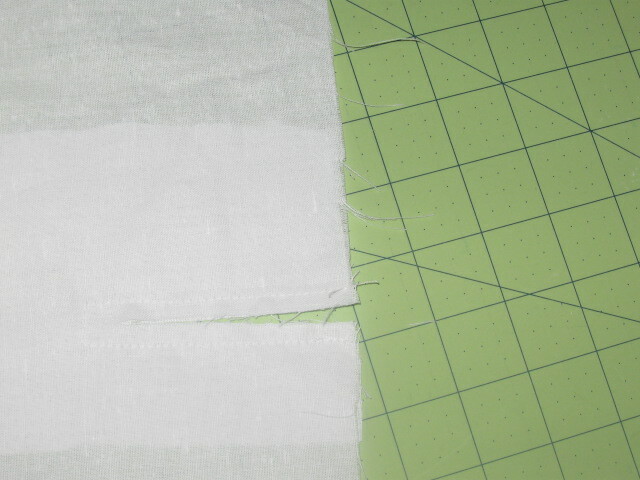 After stitching up to the marking you snip off the excess 3/8″ folded fabric approximately 1/2″ above your “u” seam and in a perpendicular cut to your 3/8″ fold. 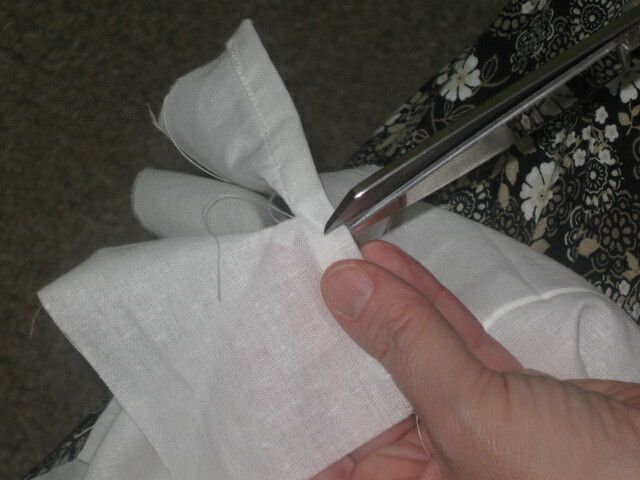 Now turn your scissors and continue cutting the excess fabric off the placket piece in a parallel cut, removing the end of the 3/8″ fold on the thin side. Now we are ready for the fat side, the side you see when you look at a shirt. 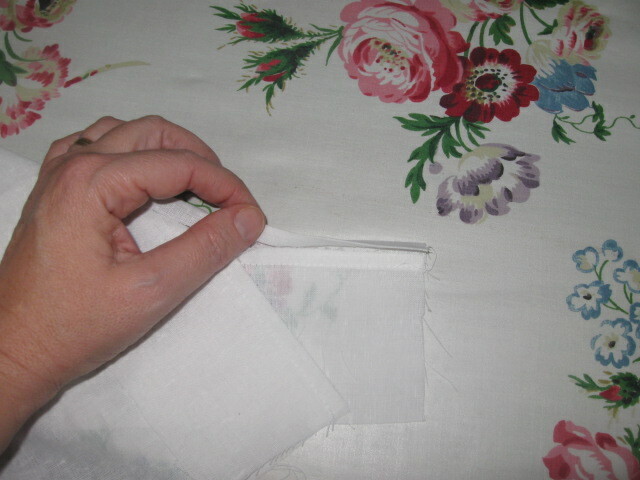 First we fold the fat side of the placket piece into thirds. 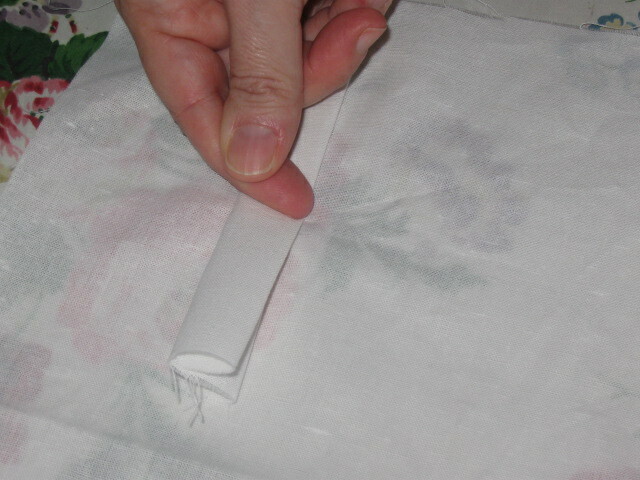 Press the first third, then fold over and press the second third, right side of placket fabric ending up on the out side. 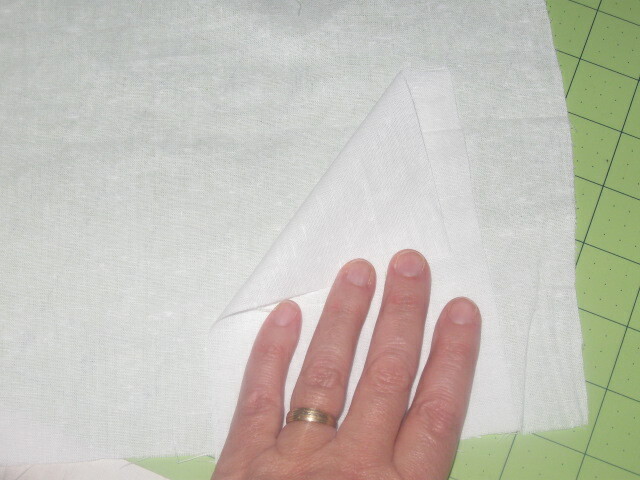 Now we are ready to make the 45 degree angle folds for the pointed professional look. You can press to help hold your shape and then you’re ready to stitch.. 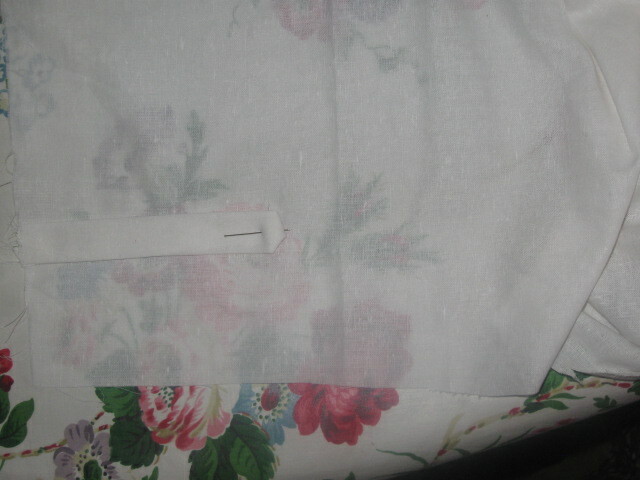 I put this finished picture in to show we top stitching is on the side of placket on the sleeve not toward the opening. 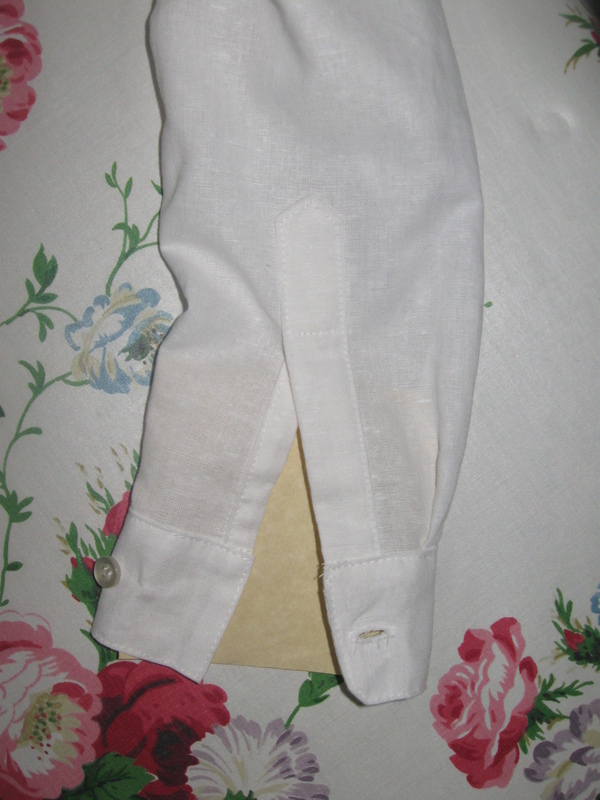 Now you are ready to attach your cuff! If you got this far the cuff is easy!! And your pattern instructions should be explanatory for that step! 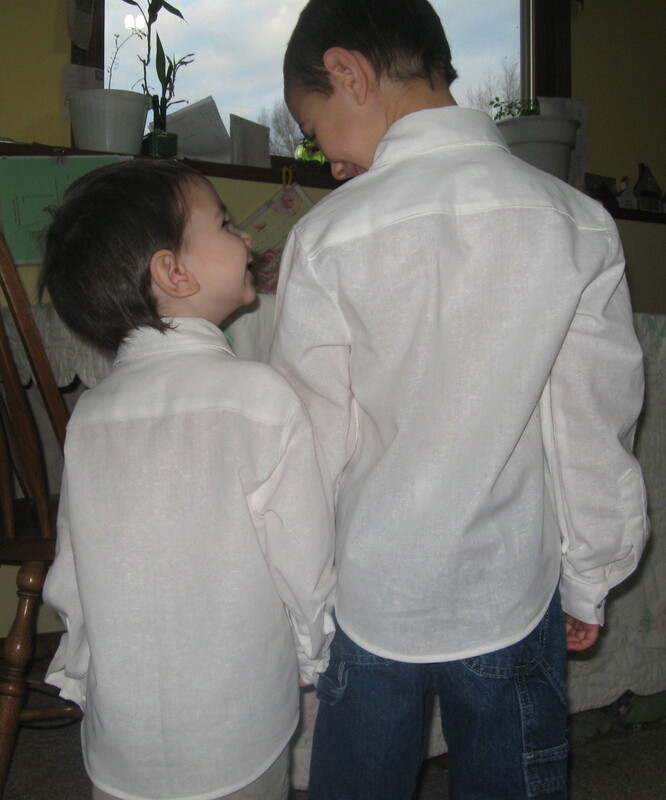 Here are my guys wearing these linen shirts..
Hope this is helpful to someone! Thank you to Victoria for all her help on this tutorial! I couldn’t have done it without her!